Dunn's Bridge, located on County Road 500 East, south of Kouts, Indiana, in Pleasant Township, spans the Kankakee River. The precise year in which the bridge was constructed seems lost to history, but numerous published sources indicate that the bridge was erected at some point in time between 1895 and 1904. Construction of Dunn's Bridge over the Kankakee River, year unknown. The 1895-1904 time frame that Dunn's Bridge was presumably constructed may not be correct. Why? 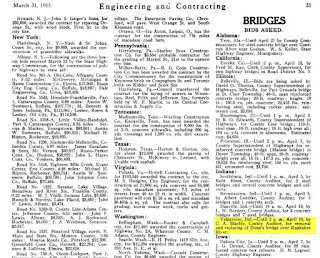 Dunn's Bridge is mentioned in at least three publications prior to 1895. For instance, John Collett, State Geologist, specifically mentions Dunn's Bridge in the 1882 annual report for the Indiana Department of Geology and Natural History, which was published in 1883. 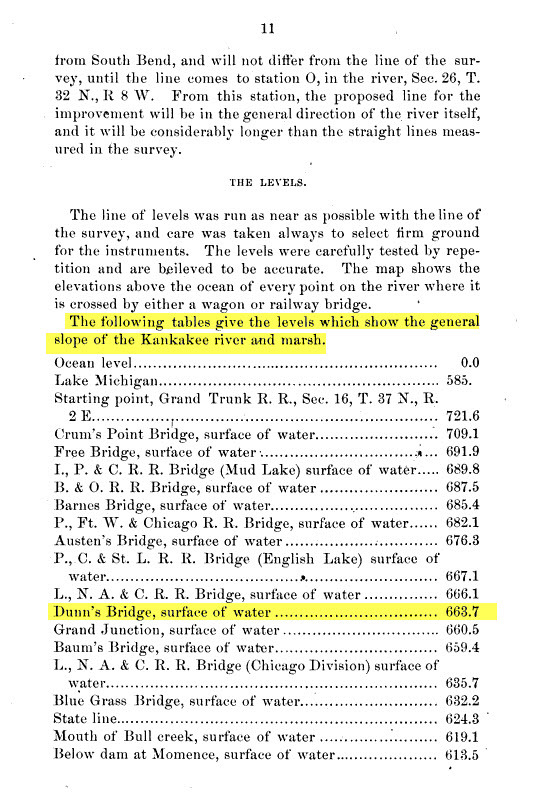 John Lyle Campbell mentions Dunn's Bridge in his Report Upon the Improvement of the Kankakee River and Drainage of the Marsh Lands of Indiana, also published in 1883. First known published mention of Dunn's Bridge. "The Kankakee is our sleeping giant, which needs only be aroused that its mighty power may be used for the benefit of the State and Nation." Perhaps the arched Dunn's Bridge we know today was not the original bridge spanning the Kankakee River at County Road 500 East? 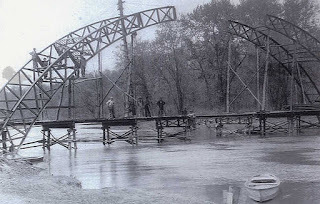 An additional factor leading to some confusion related to the date of the construction of Dunn's Bridge is that Porter County issued a notice for bids for "removal and replacing" the bridge in 1915. The removal was not an actual demolition of the bridge and the erection of a new bridge. Rather, the commissioners of Porter County and Jasper County agreed to pay for the temporary removal of the middle sixty feet of the bridge. The removal was to allow the passage of the McWilliams dredge, which was instrumental in the creation of Marble Ditch. The central portion of the bridge was removed, swung to the bank of the river, and then replaced after the passage of the dredge. Example of a notice for bids for the removal and placement of Dunn's Bridge in 1915. The bridge is named after farmer Isaac Dunn, a native of Maine. Dunn resided in Jasper County and had farm land on both sides of the river. It has been noted that Dunn erected the bridge as a means of moving his farming equipment from one side of the Kankakee River to the other side. One biography of Isaac Dunn states that he built two bridges. 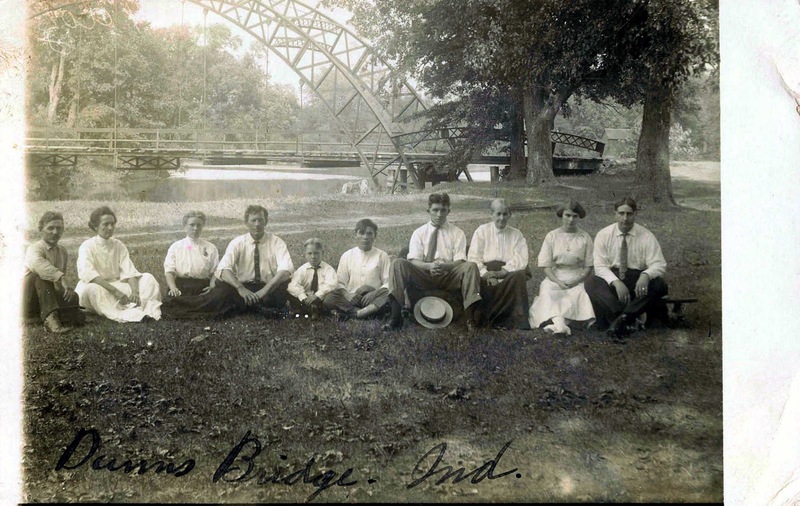 The first bridge was a wooden structure that spanned the Kankakee; this bridge was later replaced by Dunn with a "fine iron bridge." Unfortunately, Dunn's biography does not indicate the year that either bridge was constructed. Albert Hahn Company and postmarked in 1909. It has long been rumored that the structural frame of Dunn's Bridge was constructed from iron trusses taken from the world's first Ferris wheel that operated at the 1893 World's Columbian Exposition in Chicago, Illinois. This rumor is strongly believed to be untrue. First, the top of the bridge arch flattens out, while all of the components of the Ferris wheel were composed of continuous curves. 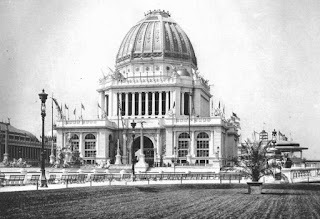 More importantly, the 1893 Ferris wheel from the World's Columbian Exposition was removed to St. Louis, Missouri, for use at the 1904 Louisiana Purchase Exposition. At the conclusion of the exposition at St. Louis, the Ferris wheel was dynamited on May 11, 1906, and sold for scrap. Thus, the bridge's construction predated the dismantling of the Ferris wheel. And it is very unlikely that scrap metal obtained from a structure that was dismantled using dynamite would be used for the construction of a bridge where life safety is of paramount concern. Burrow's Camp, postmarked in 1913. The arch of the bridge is fabricated from two six-panel, three three-panel, and two six-panel sections that are bolted to one another. I-beams sitting upon concrete abutments support the deck of the bridge at the approaches. Open girder and I-beams support the bridge deck. Each arch is attached to the deck beams by five eyebars. 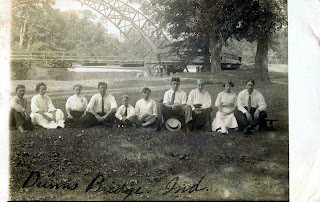 It is probable that the bridge trusses did indeed originate from the 1893 World's Columbian Exposition, but more likely from one of the domed or barrel-arched structures that were dismantled after the exposition. One persistent theory is that the arches were obtained from the dismantled Administration Building from the World's Columbian Exposition. 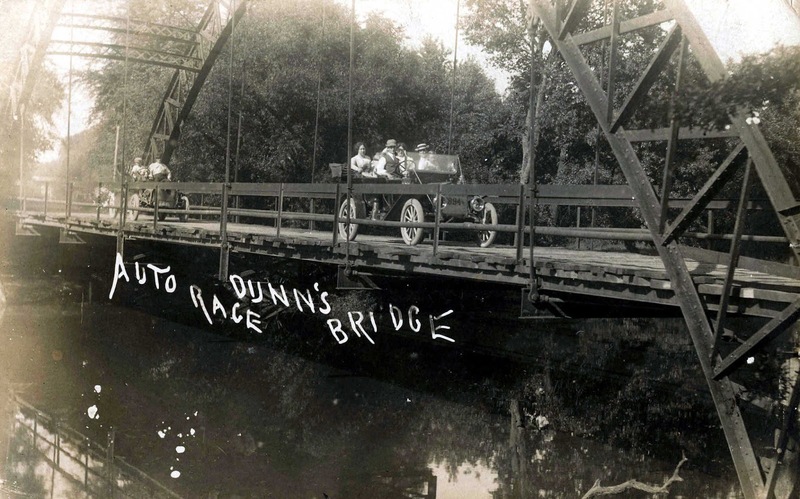 Postcard image of auto race crossing Dunn's Bridge, postmarked in 1915. "Another was the building of Dunn's bridge. It was the first iron bridge built on the upper end of the River, and was fashioned from iron salvaged from the dome of the Administration building of the World's Columbian Exposition - THE Chicago World's Fair of 1893. P. E. Lane, a Boston engineer, conceived the idea of salvaging iron from the domes and roofs of the great building which were of fabricated iron. He visioned this material going into bridges at low cost, and so it happened that during the next few years after the fair closed, the streams and rivers of Northern Indiana, particularly Lake and Porter counties, and that part of Illinois nearest Chicago, were furnished with bridge material whose first purpose had been to shelter exhibits from all over the world. There are many of these structures still in use today." "He [a reporter from the Chicago Tribune] was told that Dunn went to Chicago in 1894 and bought parts of the giant ferris wheel which was used in Chicago's Columbian Exposition of 1893. The worn out parts were scheduled for replacement. The scrap was transported to Dunn's property by rail and horse-drawn carts, and then constructed over the river by Jasper and Porter Counties." No evidence has been found to support the contention that the Ferris wheel had major structural elements replaced prior to its removal from Chicago to St. Louis. Furthermore, given that the arches were structural components rather than mechanical components of the Ferris wheel, there should have been no need to replace them due to the fact that they were "worn out." Meyer also states that records in the Jasper County Highway Department includes notes from a bridge survey conducted by E. D. Nesbitt, county surveyor, on January 6, 1933. 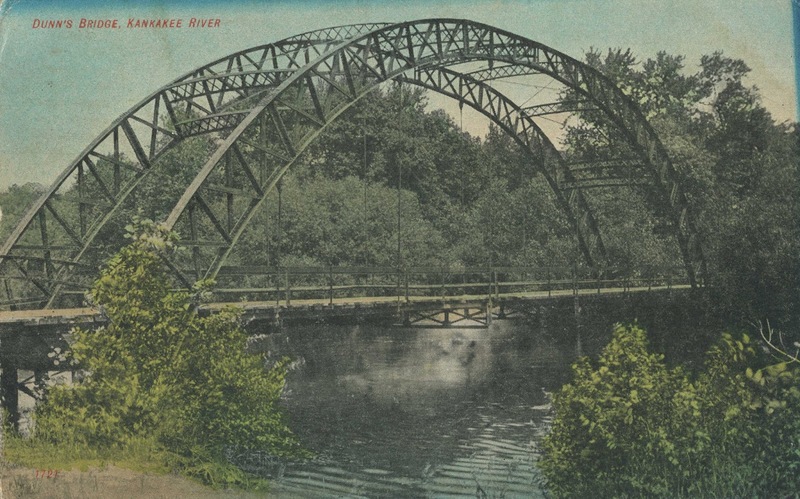 Nesbitt wrote that Dunn's bridge was constructed using "curved roof trusses from a World's Fair building used in Chicago in 1893." of this building may have been used to construct Dunn's Bridge. 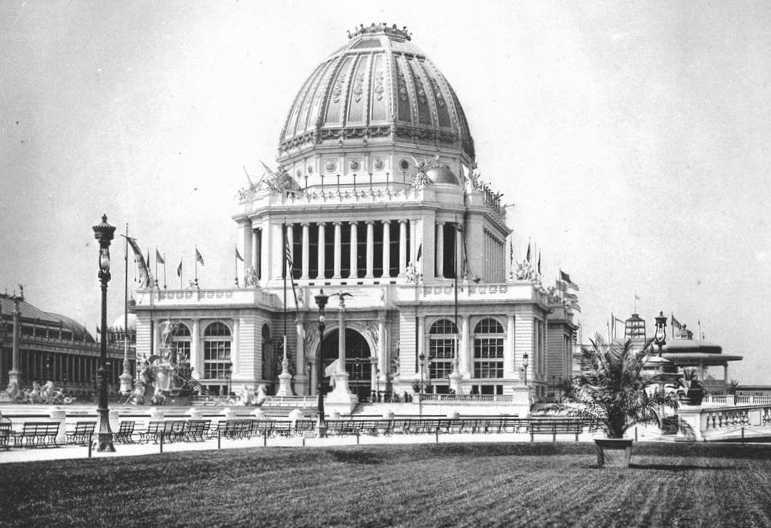 Source: Official Views of the World's Columbian Exposition, 1893, Plate 23. 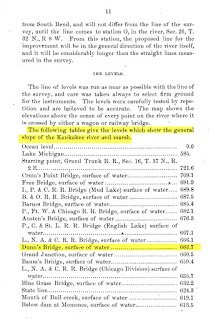 Nesbitt also wrote in his report that the south one-half of the Dunn's Bridge had been painted (Jasper County's section), while the "north half was not painted" (Porter County's section). "The proposed bridge's specifications are spelled out in detail in the commissioner's records and are definitely those of Dunn's bridge. At a meeting a week later, the two boards opened almost a dozen bids, some for wood and others for an iron and steel structure. The boards decided on an iron-steel structure. The same day a contract was signed with Lane Bridge and Iron Works of Chicago. According to the 'high cost' (high for then) it was assumed the firm supplied its own metal." Meyer includes one additional twist in his account of Dunn's Bridge. He indicates that the commissioner records of Jasper County are silent as to Dunn's Bridge from 1894 to 1900. The commissioner records do reveal, however, that Isaac Dunn was provided funds in the amount of $196 and $895 in 1899 for bridge construction. 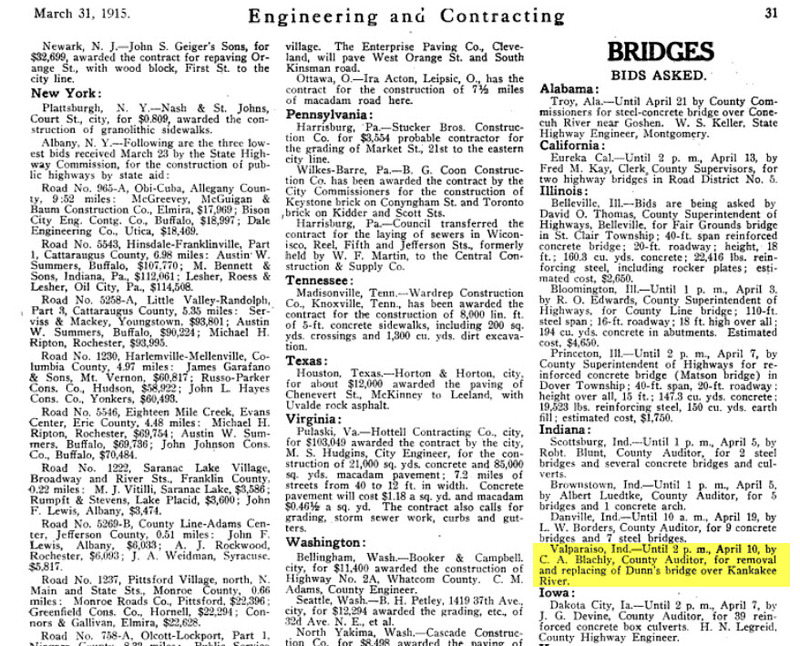 Given the totality of the facts, it appears that P. E. Lane's Chicago firm, Lane Bridge and Iron Works Company was the builder of Dunn's Bridge. To date, however, no evidence has been uncovered to determine exactly who designed the bridge, what company erected it, or the origin of the metal arches. 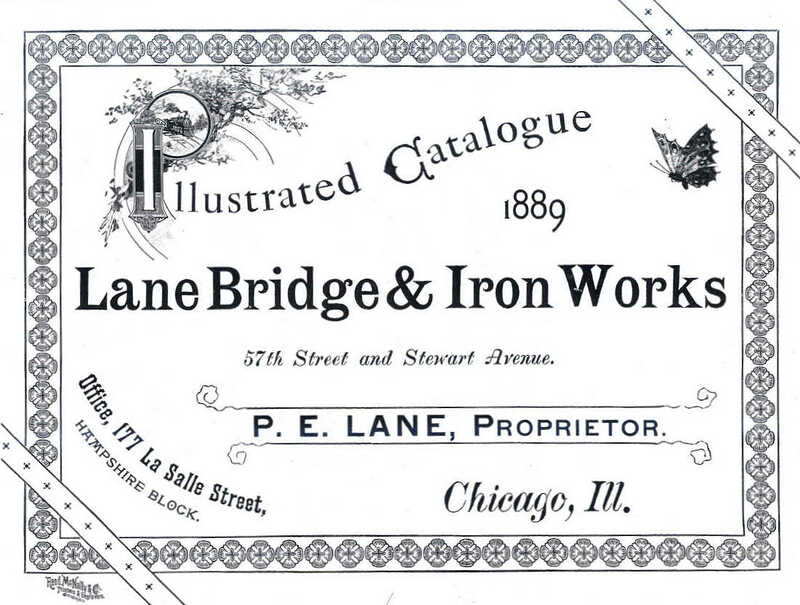 Cover page from Lane Bridge & Iron Works' 1889 illustrated catalog. 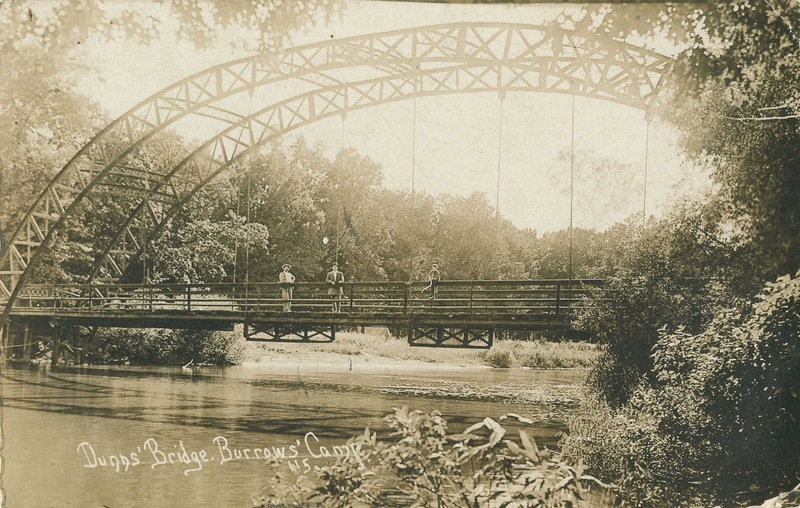 Dunn's Bridge was purchased by the Porter County Parks and Recreation Board for $8,800 in 1999 and today it is Dunn's Bridge County Park. The bridge was restored in the early 2000s, which resulted in an award at the Fifteenth Annual Engineering Banquet sponsored by the American Council of Engineering Companies of Indiana in 2003. Butler-Fairman and Seufert, Inc., of Indianapolis, now Butler, Fairman & Seufert, were the recipients of the award for their work on the project. Note that the Sugar Creek Chapel Bridge, which spans Sugar Creek and is located approximately three miles east of Milford, Iroquois County, Illinois, is extremely similar in design and construction to the Dunn's Bridge design. P. E. Lane designed the Sugar Creek Chapel Bridge, which was erected in 1904. Hence, there may be a relationship in the construction and building of the Sugar Creek Chapel Bridge and Dunn's Bridge. adjacent to Dunn's Bridge, postmarked in 1911. Lane Bridge & Iron Works. 1889. 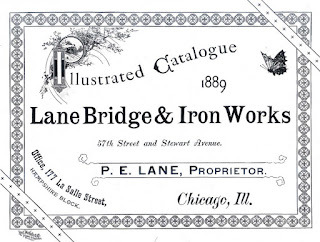 Illustrated Catalog: Lane Bridge & Iron Works. Chicago, Illinois: Rand, McNally & Company. 12 p.
Engineering and Contracting, Chicago, Cook County, Illinois; March 31, 1915; Volume 43, Number 15, Page 31, Column 3. Column titled "Bridges, Bids Asked." Good Roads, New York, New York County, New York; April 10, 1915; Volume 9, Number 15; Page 9, Column 2. The Indianapolis Journal, Indianapolis, Marion County, Indiana; April 17, 1893; Page 6, Column 5. Column titled "The Proposed Ship Canal" by J. L. Campbell. The Vidette-Messenger, Valparaiso, Porter County, Indiana; March 15, 1930; Volume 3, Page 7, Column 3. Column titled "Do You Remember the Day?" The Vidette-Messenger, Valparaiso, Porter County, Indiana; March 30, 1976; Volume 49, Number 226, Page 9, Columns 1-4. Column titled "Popular Dunn's Bridge Legend Doesn't Stand Up to Weight of Facts Uncovered by Reporter" by Jo Mannies. The Vidette-Messenger, Valparaiso, Porter County, Indiana; March 6, 1976; Volume 49, Number 206, Page 1, Column 1. Column titled "Over a Cup of Coffee." The Times, Munster, Lake County, Indiana; July 23, 1998. Column titled "Dunn's Bridge Close to Restoration" by Steve Walsh. The Times, Munster, Lake County, Indiana; December 3, 1999. Column titled "County Acquires Dunn's Bridge" by Rae Ann Rockhill. Chesterton Tribune, Chesterton, Porter County, Indiana; April 4, 2003. Column titled "Dunn's Bridge Restoration Wins State Engineering Award" by Vicki Urbanik. The Times, Munster, Lake County, Indiana; October 11, 2005. Column titled "Dunn's Bridge, A Historical Mystery, to be Rededicated Friday." Chesterton Tribune, Chesterton, Porter County, Indiana; October 17, 2005. Column titled "Dunn's Bridge Officially Opened as Porter County Park," by Vicki Urbanik.